I Was Born To Cook: Two things to celebrate! We had a wonderful time this weekend celebrating the upcoming arrival of a dear friend's baby girl. A small group of us got together at our friend Lisa's house and had a blast showering Liz with gifts - many of the cute variety. Who doesn't LOVE little girls clothes? I know I do...and I miss the little itty bitty ones! Naturally, I was in charge of baking the cake. When I emailed Liz's sister asking what her favorite was, she threw me for a loop by throwing out a specific name - the Philly Fluff cake. Off I went to google, and I found out that the bakery in her hometown is famous for it. And then I got scared. How could I possibly compete with one of the best bakeries in the area? Those of you who frequent my Facebook page may recall my status update on Saturday about using a bundt pan. I wasn't kidding - I really do feel like a 50's housewife when I bake with one! It's just so...retro. I should have had an apron on to really complete the package. I loved the look on Liz's face when she realized what kind of cake it was, and that it was homemade...and the taste? Seriously, the cake may look boring but it is really, REALLY good. Great for breakfast or dessert. Make it soon. The Fairy hails from Appliances Online and would like to share his wealth with one of you. All you have to do is leave a comment here - preferably about how much you like my cake, but you can leave him a message, too :) And maybe, just maybe, he'll pay you a visit! Preheat oven to 350 degrees. Butter and flour a bundt pan. Beat cream cheese, butter and shortening together until light and fluffy. Add flour, baking powder and salt. Beat on low until combined. Batter will be thick. Gradually add 1 cup sugar and eggs, one at a time, beating completely between each one. Add vanilla and remaining sugar. Continue beating until batter is smooth, scraping sides of bowl a few times. Pour half the mixture into prepared pan. Add chocolate and swirl the batter with a knife to spread chocolate through. Top with remaining batter and bake for about 60-65 minutes, or until a toothpick comes out of center clean. Cool for about 15 minutes then invert carefully onto cake platter to cool completely. Before serving, sprinkle with a generous amount of confectioners' sugar. I've never heard of the Fairy Hobmother but I'm excited to find out what a visit from him/her means! I need to make this! Thanks for the recipe! I also feel out of the loop, I've never heard of this Fairy Hobmother before, sound exciting though lol:). That cake is making me wish I picked up cream cheese at the grocery store this morning, it's the only ingredient I'm missing:(. Sounds good and super easy to make! Maybe next time I have family dinner I'll throw it in the oven. I think the bundt pan is a very underrated kitchen item...I can't remember the last time I used mine! I've never heard of this cake before but I love excuses to use my bundt pan. I picked up a new (to me) one in a thrift shop recently and I've been needing to try it out. This looks perfect. What a fun name, too! This cake looks great! Can I have a piece right now to go with my morning glass of milk? I LOVE my bundt pans!!! I just told my mom the other day that I want a Bundt pan for my birthday next month so I can wear my apron and prance around making bundt cakes. Lucky you! This looks delicious--I'm sold on anything with cream cheese. And how cute are those little shoe-pops? Actually, they are probably baby booties...but regardless of what we call them, they are adorable! I've never heard of this cake but it looks delicious! 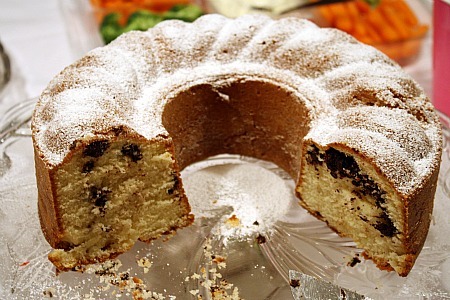 I totally know what you mean about using a bundt pan and feeling old fashioned! But I kinda love it. 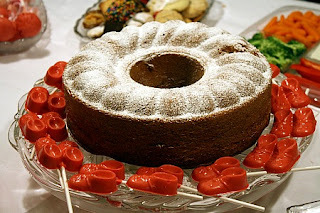 I just got one at a tag sale and am posting a bundt cake recipe tomorrow. Oh, MY! This cake looks wonderful and love those little red shoes! Ask the fairy to come visit me!! I've never heard of the Fairy Hobmother but it sounds like a great thing! I've also never heard of this type of cake but it looks delicious and I'm loving all the ingredients! Honestly, it was one of the best cakes I've ever had and I've been nursing the leftovers (and not sharing them with Glenn!). I have never heard of this cake, but definitely need to try it. It looks delish. Thank you for sharing! My son is sick today, so I'm at home, and I've been considering breaking out my bundt pan to make a bourbon and pumpkin spice cake. :-) I love bundt pans...I even have a mini bundt cake pan! :-) And I'd love the Fairy Hobmother/father (?) to come visit! I just made this cake and it's awesome. I wish it was as pretty as yours but it tastes DEVINE. I am going to add more chocolate though (next time!) Thanks to both you and Liz---great collaboration lol.